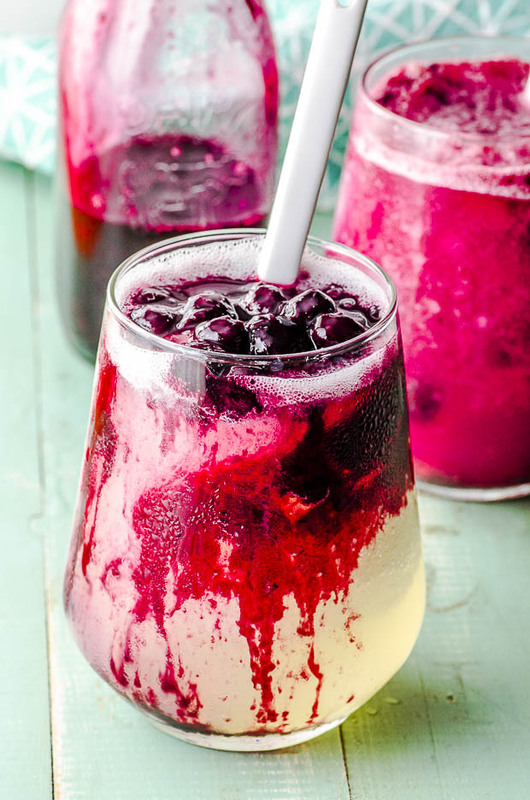 This refreshing Frozen Blueberry Lemonade will become your new favorite frozen summer drink. Made with a delicious combination of tangy lemons and sweet blueberries. Our Blueberry Lemonade is a slushy of sorts, which is why it is our kids’ most requested drink on a hot summer day. Only that is just part of the story. Our Blueberry Lemonade features a delightful table-top assembly that the kids (and adults!) simply just go crazy for. 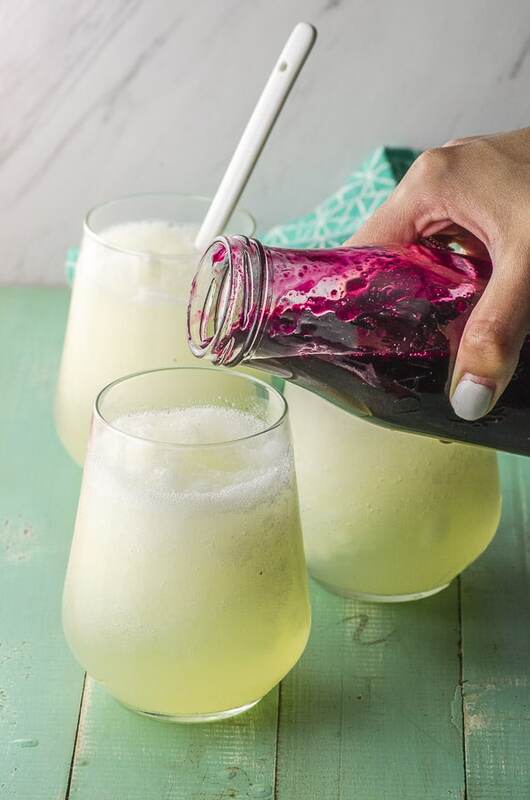 We start off with a traditional lemonade recipe with fresh lemon juice, sugar, and cold water mixed — in the blender — to be sure that all of the sugar is dissolved. We then add ice cubes and blend into a sweet lemon slush. Pour into tall glasses or in a clear pitcher that can withstand frozen drinks, and serve with long-handled iced-tea spoons. 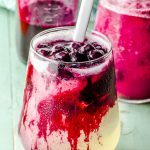 Here’s the best part — serve the lemonade with a pitcher of thick and fruity blueberry sauce and invite your guests to top off their drinks with beautifully-hued, sweet blueberries! Everyone will stop to watch the painterly effects of the thick blueberry sauce float to the bottom of their glasses. It truly is table art, and is so refreshing! Coconut Sugar – We advise using a blender, so the coconut sugar will properly dissolve. Simple syrup – Equal parts sugar and water dissolved over medium heat and then cooled. 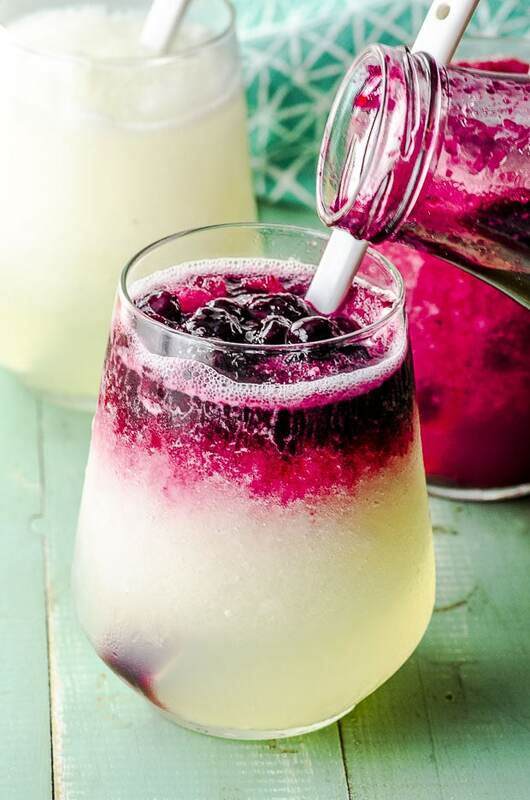 Did you like this recipe for Frozen Blueberry Lemonade? Leave us a rating! Did you love it? Share it or leave us comment on Twitter or Facebook! Wanna see more? Subscribe to our blog and remember to follow us on Pinterest! In a small saucepan, combine blueberries, water, sugar and a splash of lemon juice. Bring to a boil. In a small bowl, mix 2 tsp water and cornstarch until combined. Add to blueberries and reduce heat. Cook for about 2 minutes until it thickens. Refrigerate to cool. Combine lemon cold water, lemon juice and sugar in a blender. Blend for a few seconds until the sugar has dissolved. this sounds delicious how long can the sauce be kept in the fridge for ? You can keep the sauce in the refrigerator for up to a week, as long as it doesn’t become “contaminated” (meaning nothing gets to it, like crumbs, dirty spoons, etc). It’s great on ice cream and even make a great topping for cheesecake! Enjoy!! This is sooo refreshing!!! I love the blueberry and lemon combo!! Will for sure be making this drink again! I made it last night. Simply delicious! Thanks so much. We are so glad you tried it. Thank you for sharing! This is just what I’m looking for! Something to cool me down this summer. I hear you!! We have another heat wave coming!! Hope you enjoy it!